The KSZ8567 is a fully integrated layer 2, managed, seven-port 10/100 Ethernet switch with numerous advanced features, designed to exceed Automotive AEC-Q100 Grade 2 (-40°C to +105°C) and EMC requirements . Five of the seven ports incorporate 10/100 Mbps PHYs. The other two ports have 1000 Mbps MAC interfaces that can be configured as SGMII, RGMII, MII or RMII. Either of these may connect directly to a host processor or to an external PHY. Full register access is available by SPI or I2C interfaces, and by optional in-band management via any of the data ports. PHY register access is provided by a MIIM interface. Security features include support for IEEE 802.1X port-based authentication and Access Control List (ACL) filtering. 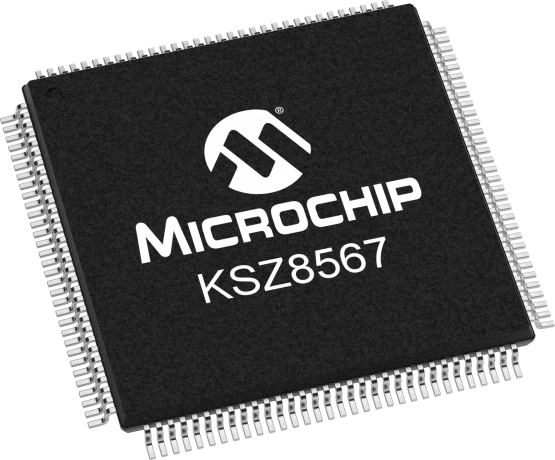 As a member of the EtherSynch® product family, the KSZ8567 incorporates full hardware support for the IEEE 1588v2 Precision Time Protocol (PTP), including hardware time-stamping at all PHY-MAC interfaces, and a high-resolution hardware “PTP clock”. IEEE 1588 provides sub-microsecond synchronization for a range of industrial Ethernet applications. The KSZ8567 fully supports the IEEE family of audio video bridging (AVB) standards, which provide for high quality of service (QoS) for latency sensitive traffic streams over Ethernet. Time-stamping and time-keeping features support IEEE 802.1AS time synchronization. All ports feature credit based traffic shapers for IEEE 802.1Qav, and a time aware scheduler as proposed for IEEE 802.1Qbv. An assortment of power-management features including Energy-Efficient Ethernet (EEE) have been designed in to satisfy energy efficient environments. Microchip's complimentary and confidential LANCheck® online design review service is available for customers who have selected our products for their application design-in. The LANCheck online design review service is subject to Microchip's Program Terms and Conditions and requires a myMicrochip account.